New York City is one of the most segregated school systems in the country, but some schools buck the trend and enroll a mix of children of different races and income levels. How do they do it? And how can their success be replicated? The staff of InsideSchools, a project of the Center for New York City Affairs, visited 80 elementary schools to find out how some formerly high-poverty schools have succeeding in attracting children from a range of races, ethnicities and income levels. We published our findings in a new report: "Integrated Schools in a Segregated City." We discovered integration doesn’t happen by accident: it takes commitment and hard work. Most important is having a principal who values diversity and welcomes families of all races, ethnicities and income levels. That may seem obvious, but at a surprising number of schools we visited, the principal set a tone that made parents of different groups feel excluded. Schools that attract children of different backgrounds have a challenging curriculum, with lively class discussions and plenty of writing assignments. That, too, sounds obvious, but many high-poverty schools rely on scripted lessons that only teach basic skills. Sometimes the catalyst for integration comes from parents. When parents of different backgrounds work together to make sure everyone is included, the results are tangible. Opening a new building or adding special programs—such as dual language classes in English and Spanish (or another language)—can also make a difference. Persistent housing segregation makes school integration difficult in large swaths of the city, particularly at the elementary level when most children attend school close to home. However, the diversity and density of many New York City neighborhoods means there is potential for many more schools to be integrated. This report offers 10 strategies that have made some New York City elementary schools more diverse. 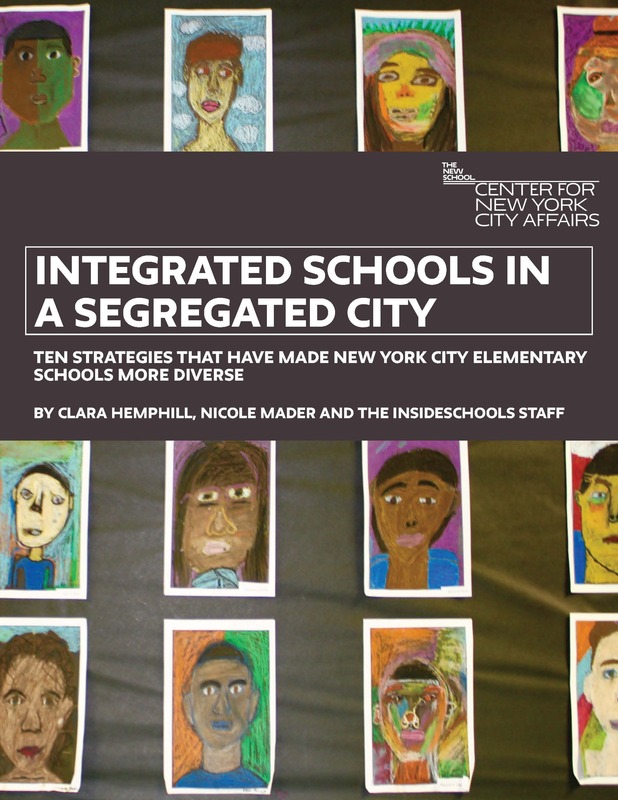 Read the full report: "Integrated Schools in a Segregated City." Clara Hemphill, director of education policy and InsideSchools at the Center is moderating a panel discussion on the report's finding on Wednesday October 26. Watch a live feed of the event starting at 9 am here.